The UNIMED WEEK IN BRUSSELS seeks to propose a political reflection from the Euro-Mediterranean academic community on the role of the European Parliament and the European Union itself in the Mediterranean region, offering a moment of evaluation and revaluation of regional policies. At the same time, the UNIMED WEEK IN BRUSSELS is an opportunity for universities to better understand the tools made available by the European Parliament and the European Commission, as well as an occasion to promote mutual understanding and to share and discuss different point of view on the cooperation with the Mediterranean region. The UNIMED WEEK IN BRUSSELS is set up as a forum for discussion, certainly political but not only, in the European Parliament ensuring the participants an interactive debate also during specific work sessions with the different DGs active in the cooperation with the Mediterranean. The UNIMED WEEK IN BRUSSELS will be an important event where the participation of the Rectors of our member universities and their International Relations Delegates is highly encouraged and expected. 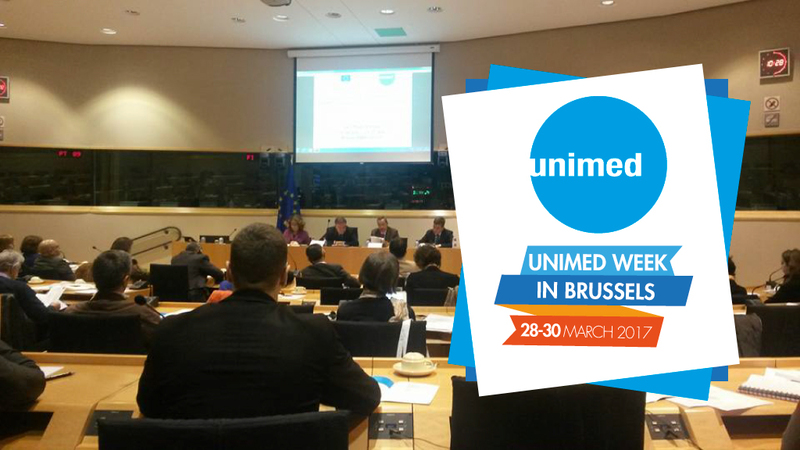 Last year, more than 70 delegates participated to the UNIMED WEEK IN BRUSSELS. Participants were Rectors and Presidents, International Relations Delegates, representatives of International Relations Offices and representatives of international organisations and institutions coming from 8 European countries (Belgium, Cyprus, France, UK, Finland, Italy, Spain and Portugal) and 6 non-EU countries (Algeria, Egypt, Lebanon, Libya, Morocco, Palestine and Tunisia). increasing more social responsibility in the university system to face to the new challenges of the region. Building on the last years’ experience, we wish the UNIMED WEEK in BRUSSELS 2017 will be a good opportunity to get even more people engaged in sharing and discussing different point of view on the cooperation with the Mediterranean region. On behalf of UNIMED President, Prof. Wail Benjelloun, please find here the Post Event Report of the UNIMED WEEK IN BRUSSELS 2017 that was held last 28-30 March 2017. Thanks to the success achieved by this event, UNIMED is already working for the organization of the next UNIMED WEEK to be held hopefully on March 2018. I do hope that you will participate in this event.